A great way to spend the day during school vacation week and complete the 10 or 20 mile hike requirement for the Hiking Merit Badge. 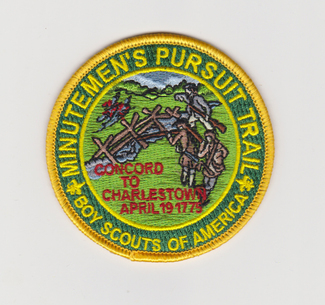 Join scouts and scouters from throughout the Spirit of Adventure Council hiking one of the BSA’s newest National Historic Trail –Minutemen’s Pursuit Trail – on the actual date that the Minutemen pursed the British from the Old North Bridge to Boston. Enjoy a stop for ice cream in Lexington, lunch in Arlington and donuts Union Square. Then ride the train back to Concord. Complete the questionnaire provided at the hike. PLEASE NOTE THIS HIKE IS VERY LONG. SOLO SCOUTS CAN NOT BE SUPPORTED BY THE ORGANIZERS. (EXCEPTIONS MAY BE GRANTED FOR SCOUTS OF STAR RANK OR ABOVE AND/OR THOSE SCOUTS WHO HAVE COMPLETED ALL REQUIREMENTS OF THE HIKING MERIT BADGE, EXCEPT THE 20-MILE HIKE.) PLEASE CONTACT THE ORGANIZERS FOR MORE INFORMATION. Camping may be available at Camp Acton only 4 miles from the start of the hike. Troop 71 of Chatham will be camping there the 18th and 19th and will welcome "provo" scouts to camp with them. Email [email protected] of Troop 71 for more info on camping. More information about the trail can be found at the Concord Scout House web site here. Troop and scout you are associated with?